Speaking on the campaign trail with First Lady Michelle Obama, Democratic presidential candidate Hillary Rodham Clinton announced that “dignity and respect for women” is on the ballot this election. Republican candidate Donald Trump’s obscene remarks about women have been a saving grace for Clinton, who has been mired in controversy from the inception of her campaign—especially regarding the role played by her namesake charity, the Clinton Foundation, while she served as Secretary of State. When I put a hold on Mrs. Clinton’s nomination as secretary of State, she reassured me that they would take appropriate steps [to avoid conflicts of interest]. As seems to be usual for the Clintons, they crossed the line and all the concerns that she reassured me would not occur did in fact occur. Back then, Cornyn had stalled the confirmation process over concerns about potential conflicts of interest given the charity’s ties to foreign powers. He was not alone. Even then-Senator John Kerry expressed his concerns over the less-than-forthcoming way in which the charity approached disclosure of its foreign donations. Nevertheless, he supported and indeed encouraged her confirmation. Clinton sought to allay the concerns of the holdouts granting assurances that she would take proper steps to keep the foundation and State Department separate, eschewing even the appearance of overlap. However, we now know that that never happened. In one of Clinton’s paid private speeches, which came to light thanks to the release by Wikileaks of thousands of hacked emails from Clinton campaign chair John Podesta, Clinton bemoaned ethics rules designed to prevent conflicts of interest for public servants. “There is such a bias against people who have led successful and/or complicated lives,” she lamented. This attitude appears to have informed her behavior while serving as the nation’s top diplomat. wjc and hrc do a lot of giving, to their family, to their staff, and to their friends. They are trying to be better partners to the foundation and save some of their resources — not an unreasonable thing for them to choose to do given where they are, how much they’ve made and how little they have saved. Other emails obtained earlier this month through a Freedom of Information Act lawsuit by the Republican National Committee, and reported on by ABC News, revealed that in the immediate aftermath of the devastating 2010 earthquake in Haiti, while the State Department was reviewing applications for federal grant money to provide assistance, Clinton gave preference to those applicants marked “FOB” (for “Friends of Bill”) or “WJC VIPs” (William Jefferson Clinton VIPs) by Clinton Foundation employees. Those who were not flagged were directed to the generic government website, cidi.org. These are just the latest revelations; the ethical questions surrounding the foundation—especially whether or not Clinton used it for pay-to-play dealings at the State Department—are legion. 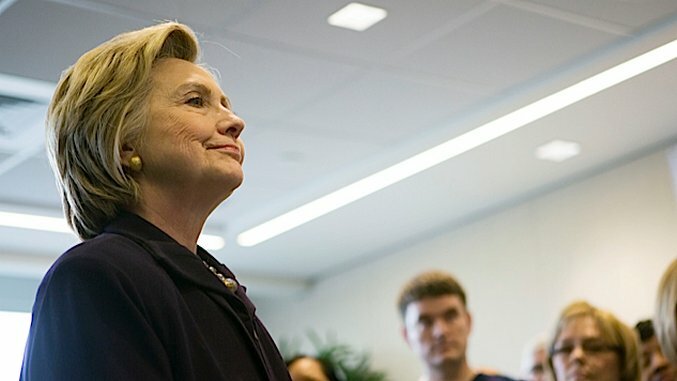 In August, the Associated Press pointed out that when government officials were excluded, over half of the people Clinton met with as Secretary of State were foundation donors. Moreover, Clinton had given special assistance to a foundation donor and personal friend applying for a passport. Before that, in June, ABC News published a story about how Rajiv K. Fernando, who lacked any experience or expertise in the field, wound up on a top secret nuclear security board with a number of experts. Turns out, his promotion came at the request of Clinton’s chief of staff, Cheryl Mills, a Clinton Foundation donor. What’s more, Fernando stepped down following ABC’s inquiry. An International Business Times investigation from May found that throughout the course of her tenure as Secretary of State, countries that had donated to the foundation saw increases in weapons sales from the State Department at higher rates than non-donor nations. At the same time, defense contractor donors, or those who had paid Bill Clinton for speeches, were more likely to receive contracts authorized by the department. These reports comport with several previously reported stories. The Wall Street Journal reported in July of 2015, that shortly after becoming Secretary of State in 2009, Hillary Clinton helped the Swiss bank UBS out of hot water with the Internal Revenue Service after it donated to, and partnered with, the Clinton Foundation. UBS then paid Bill Clinton the largest speaking fee he’d ever received at the time the article was published. Then, in 2010, an incident bearing a striking resemblance to the UBS affair became public: As the Washington Post later reported, Secretary Clinton helped Boeing secure a $3.7 billion deal to sell aircraft to the Russian government. Two months later, Boeing turned around and donated nearly $1 million to her public charity. Yet another interesting story, with all the same trappings, was reported by The New York Times in April, 2015: Between 2009 and 2013, as Russia slowly gained control of Uranium One, the world’s largest uranium production company, UO’s chairman donated millions to the Clinton Foundation, and a Kremlin-linked investment bank paid Bill Clinton $500,000 for a speech. The donations continued right up to the approval of a final deal which involved a number of agencies—including Clinton’s State Department—but were not disclosed to the Obama administration. More than a charity, the Clinton Foundation is obviously a vehicle for personal and political advancement. It represents unchartered waters for American electoral politics. The conflicts of interest it has raised are historic. Many foundation donors are also campaign donors helping to put the former Secretary in the White House. And yesterday, news broke that former top Bill Clinton aide, Douglas Band, solicited speaking fees and gifts for the former president from donors to the foundation. Hillary Clinton has long defended her family’s foundation, arguing that its benevolent works around the world speak for themselves. Such was the response she delivered at the final general election presidential debate when asked about the apparent pay-to-play. However, that answer is unlikely to satisfy voters as time goes on—especially if she is elected president, and Donald Trump is no longer a concern. House Republicans are already gearing up to investigate Clinton if she wins the election. That news should worry Democrats looking ahead to the midterms in 2018, and the Census year presidential election in 2020—especially given the likelihood that they will subpoena the former Secretary to testify under oath. Hearing this news, it’s hard not to remember the presidential impeachment that dominated the news in 1998. Although 2016 may soon see the election of another President Clinton, history may repeat itself in more ways than one.